This Feiss Regent Court 2 light flush mount outdoor porch lantern in walnut finish with rippled glass panels and rated IP44 is traditional and elegant. Circular wall mount and domed lantern, with detailed moulding around the rim featuring rosettes and leaves. Curved panels are fitted with hand-made water glass panels and two lamp bulbs hang inside. If you are searching for a traditional outside porch lantern to give your home a lift, the Regent Court collection is certainly one to consider. Finished in a walnut bronze with gold highlights, this stately exterior lantern boasts hand blown clear water glass, die-cast aluminium construction and supplied with a 3 year anti-corrosion guarantee. This exterior light is supplied by Elstead Lighting and designed in the USA by Feiss, founded in New York in 1955. 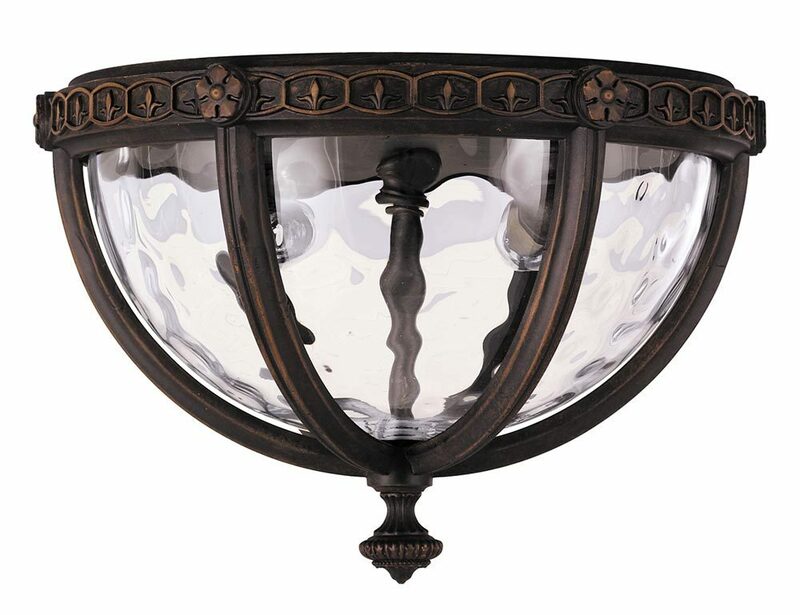 They have become well known over the years for their contemporary yet classic styling, quality and great original designs like the Regent Court 2 light flush mount outdoor porch lantern in walnut finish with rippled glass panels and rated IP44 you see here.